It would seem there are new kids on The Block. 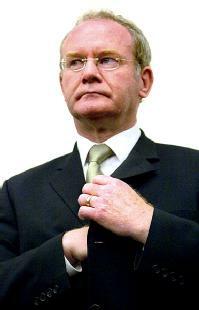 Mr McGuinness, the province's Deputy First Minister, said: "I was a member of the IRA, but that war is over now. I wonder how many people were inspired by this guy and his ilk to pick up where he is purported to have left off. So much for "Not negotiating with terrorists"? 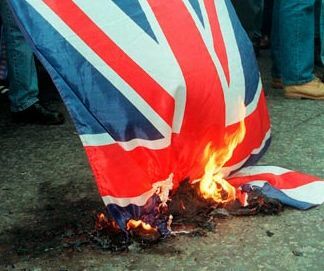 He and Adams "retired" from their IRA links to be paid vast sums of income from the bereaved taxpayers. Never liked it and never understood this peace at any price. What terrible memories does he harbour, I wonder? Does he remember the screams of agony he witnessed, the brutal killings and maiming of innocents. Or is his cushy, recession proof life as Deputy First Minister sufficient to dull those memories? I think he was a bomber - you tend to be a long way away when a bomb goes off - often in another country - when the detonation mincemeats people who this skid mark isn't fit to look at. He is employed as deputy leader of Sinn Fein and has a portfolio in the Assembly. One day I decided to watch his performance in the Assembly to find out what he did. It was the most cripplingly boring speech I have heard for some time. All he seems to be able to do is to read (not well) from prepared statements. He appeared uninspired and out of his depth - that it what happens when you give former thugs and murderers a job that requires finesse and intellect. that it what happens when you give former thugs and murderers a job that requires finesse and intellect.